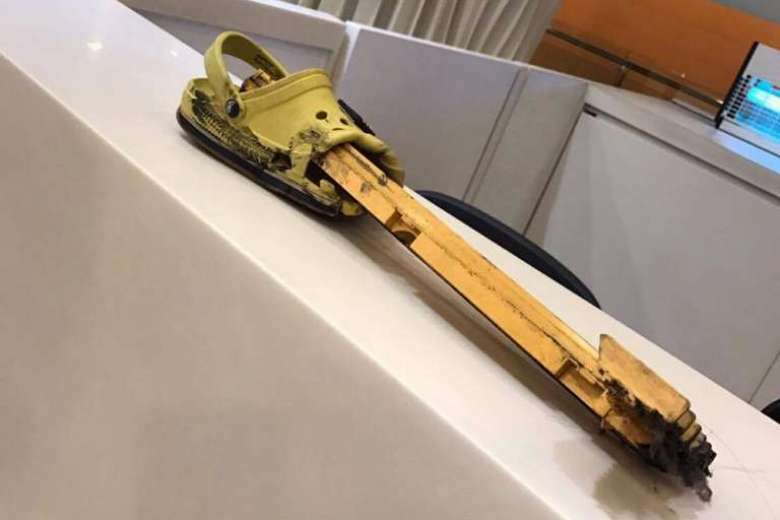 SINGAPORE - A metal piece broke off from an escalator step and pierced a young boy's Crocs shoe at AMK Hub last week. 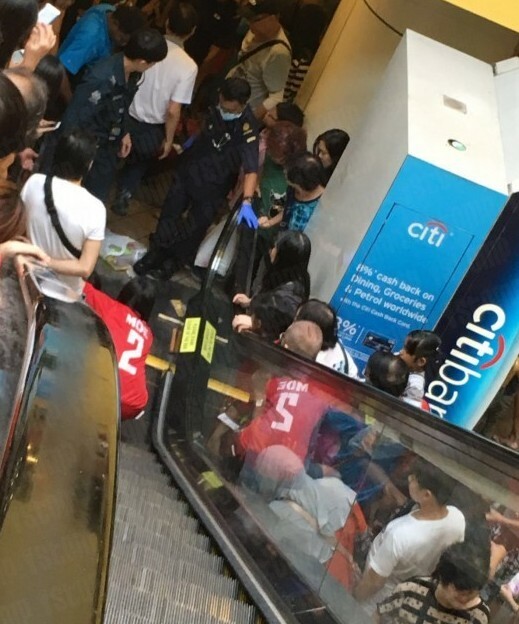 The incident happened on Dec 15 at about 1pm at Basement 2 of the heartland mall in Ang Mo Kio. 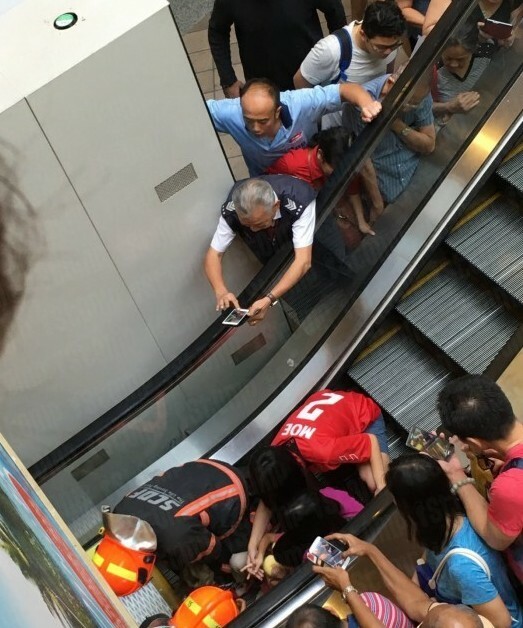 A spokesman from AMK Hub said that no one was injured and the escalator has been repaired. But the five-year-old boy's grandmother, unhappy at the mall's handling of the incident, shared her grouses online. She told Stomp that her grandson has developed a phobia of escalators. 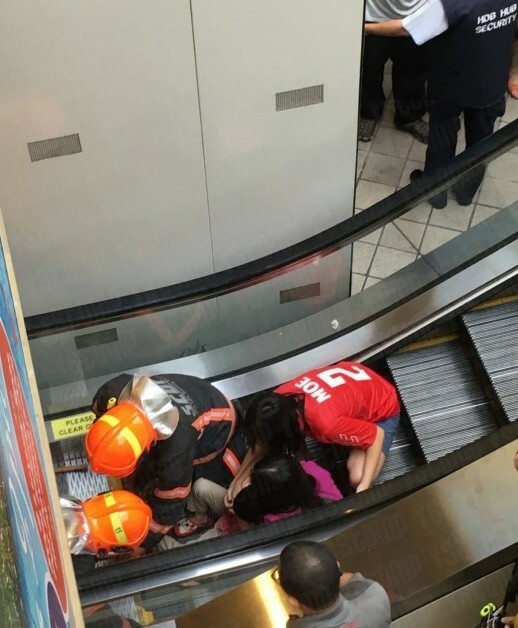 She also said that she saw the escalator still in operation, hours after the unfortunate incident. The grandmother, known only as Stomp contributor M, declined to be interviewed by The Straits Times. AMK Hub's spokesman has said that they are in touch with her. In her account on Stomp, she said that they were going down the escalator and heading to NTUC. "My grandson and his mummy were standing behind me. Halfway through, we heard something like the sound of chains dropping. "I turned back my head, I saw my daughter carry his son and the next moment, we saw that his left shoe had something poking into his shoe. "When we reached the end, we saw that one part of the escalator step had broken into a mysterious way. Everyone who saw that were totally stunned." She added: "Thank God his left foot was okay. We were so shocked we didn't know what to do and many people came crowding around." 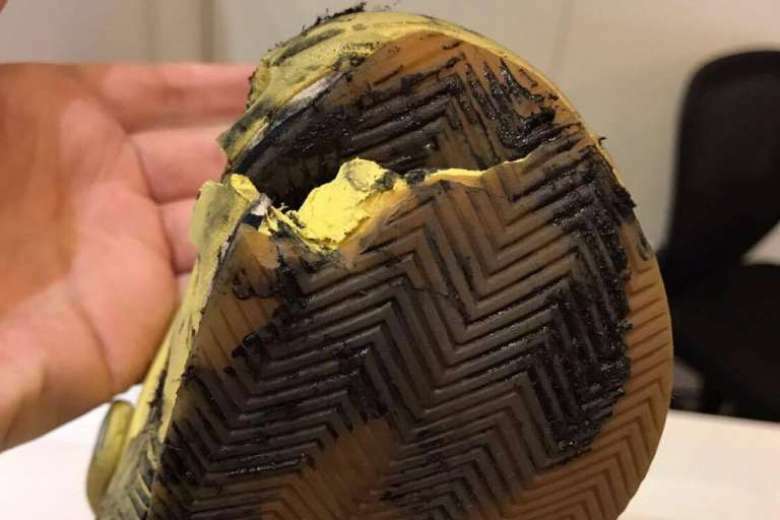 She then complained that the mall's customer service went to buy a pair of shoes for her grandson but bought Crocs shoes - which was what her grandson was wearing during the incident. "I was so shocked at why are they buying this same type of shoes and the lady who had gone to buy them told me that she actually wanted to buy flip flops instead, which is even more shocking!" she told Stomp. "Is this all they can care for a kid who was shocked after the escalator poked his left foot for no reason?" She also said that the family forgot what they wanted to buy after the shock, and "just roamed around for a couple of hours". 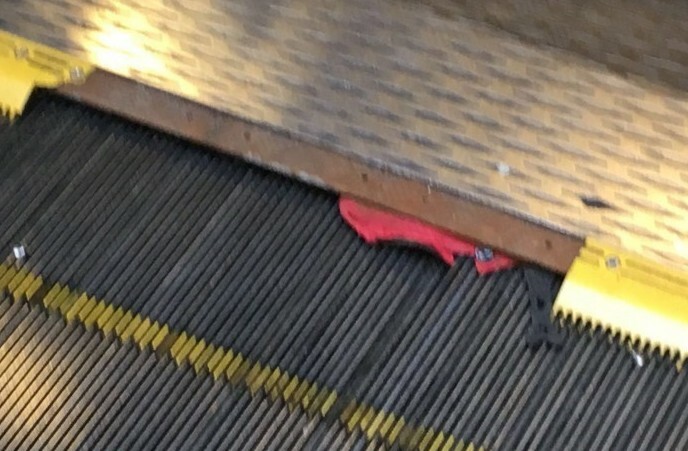 "I saw that they still let the escalator continue running, without anyone coming to investigate," she said. 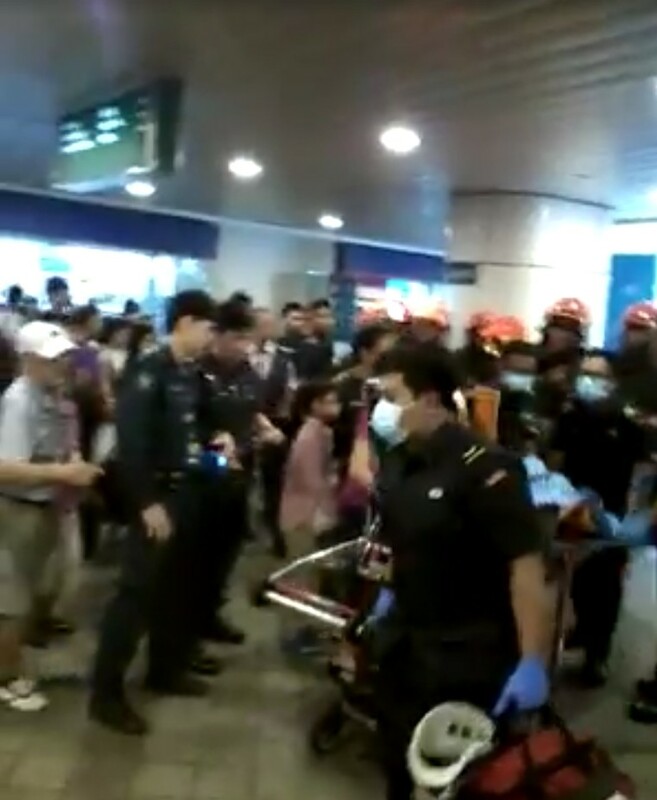 However, AMK Hub said that the affected escalator was stopped immediately. The mall's escalator service provider, Otis, checked on the escalator, and found the gears in "good working order". 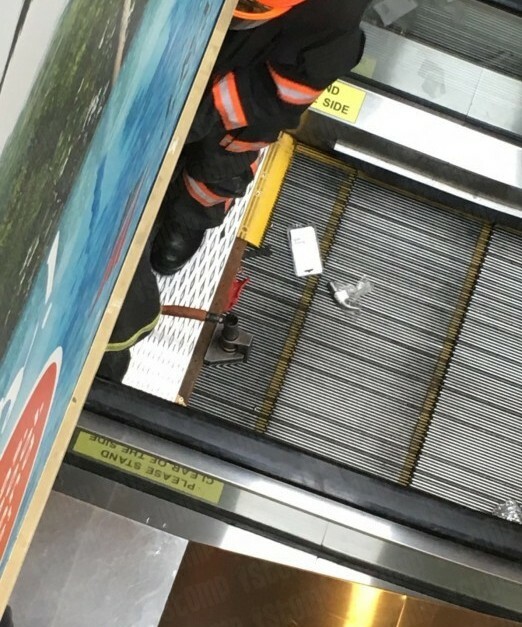 "The broken insert was replaced and a thorough inspection conducted to ensure that the escalator is safe for use before it resumed operation," it said in a statement. 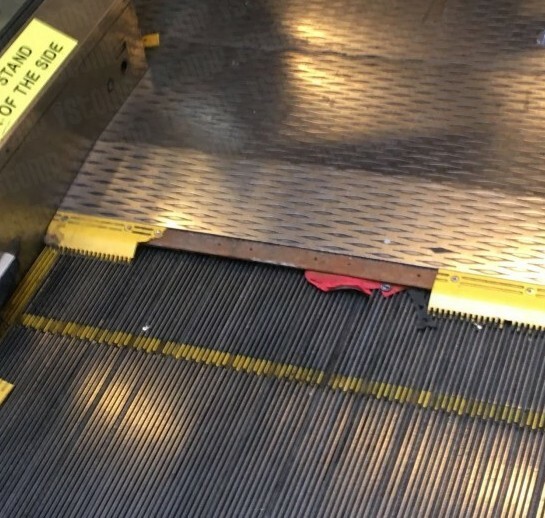 The checks made included the gears, the steps and handrail alignment, as well as to ensure that there is no jerking motion when the escalator is running, AMK Hub said. It added: "While we regret this unfortunate incident, we hope that shoppers stay constantly mindful of their own safety and take the necessary precautions for themselves and members of their family." 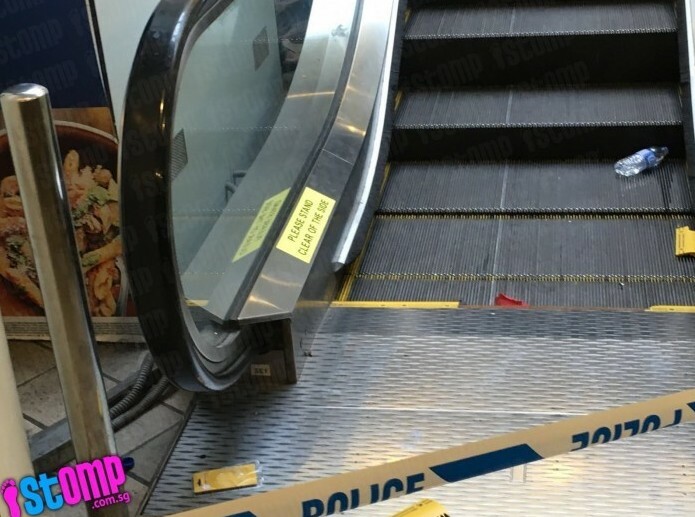 The escalator was last serviced on Dec 1, the spokesman said. 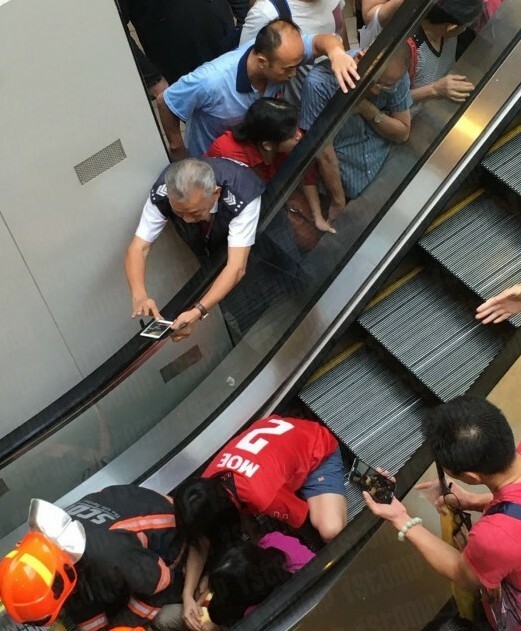 A young boy got his foot caught between escalator steps near Toa Payoh HDB Hub earlier this afternoon (June 4) at around 1.15pm. An eyewitness who was at the scene, said the child was "screaming away" as Singapore Civil Defence Force (SCDF) personnel and maintenance staff tried to free him. A woman, named Vivian, said that the incident happened at around 1.15pm at the outside area near Toa Payoh HDB Hub. The boy's mother was with him when the incident occurred. "He was eventually freed. You can see his shoe still stuck in the escalator in the pictures." Facebook user Vivian Sng, who posted a video showing the boy being taken away after he was freed, said the child's feet might have been fractured. 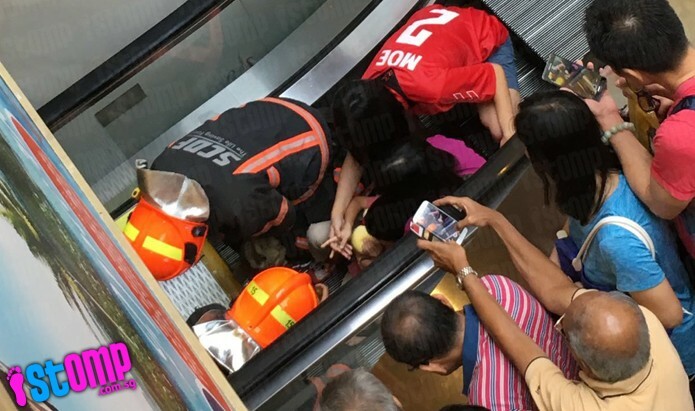 In a statement, SCDF said that it was alerted to a rescue case at around 1pm involving a child's toes being stuck in an escalator. One fire engine, one Red Rhino, one ambulance and two support vehicles were dispatched to the incident site. 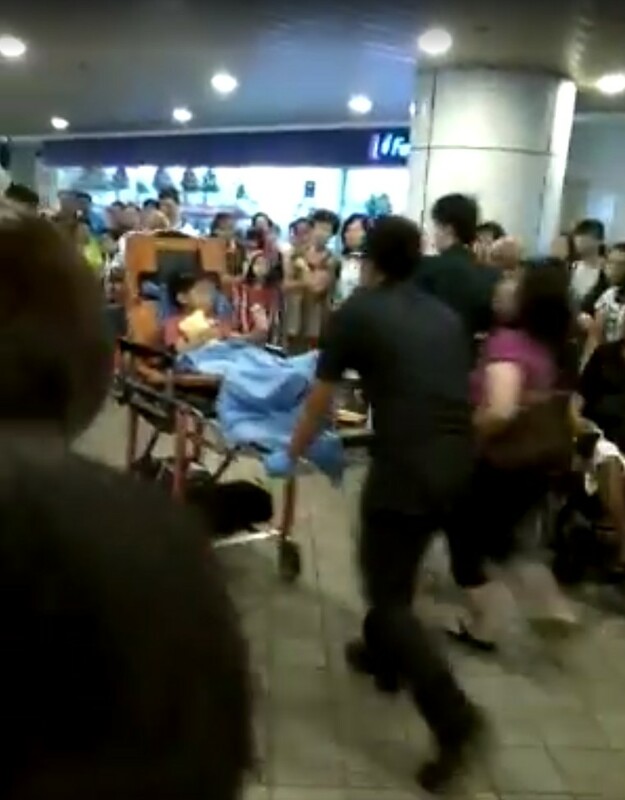 "SCDF released the child using hydraulic rescue tools and he was conveyed conscious to KK Hospital. The hospital was also alerted to be on standby to assist the child."